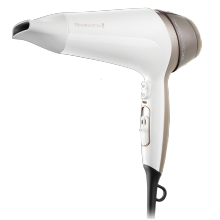 With the Thermacare Pro 2200 you can dry your hair fast with less heat*, offering you the protection you want, without compromising on style. 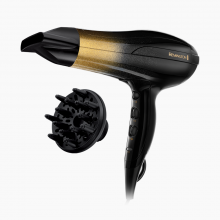 This powerful yet gentle hairdryer gives the performance of a 2200W but with less heat, meaning drying your hair can be done quickly while taking the worry out of heat styling. The stylish matte black hairdryer not only looks great, but comes with a ceramic ionic grille, providing even heat distribution and anti-static. 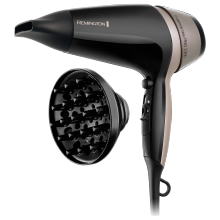 This means that you can control your blow dry easily, leaving you with smooth, sleek and protected hair. 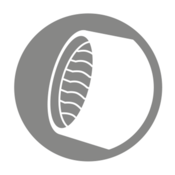 The rear grille is also removable and easy to clean, making it easier than ever to maintain. Variable heat slide controls allow you to choose from three heat and two speed settings, so you can discover the right temperature and air flow for you. The cool shot function helps you to set your style in place so you’re ready to head out and show the world you mean business. The Thermacare Pro 2200: For a cool, collected you. A 2000W hairdryer with the drying performance of a 2200W means your hair dries fast with less heat – helping you protect your hair whilst you style. Say goodbye to frizz and over styled areas. 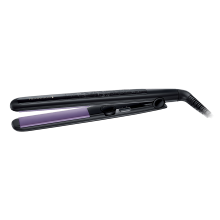 Even heat distribution combined with antistatic properties allows you to achieve a shiny finish every time. 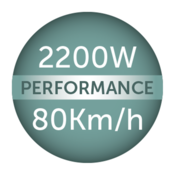 Powerful yet gentle 2000W dryer; same drying speed as a 2200W dryer but with less heat for more protection.